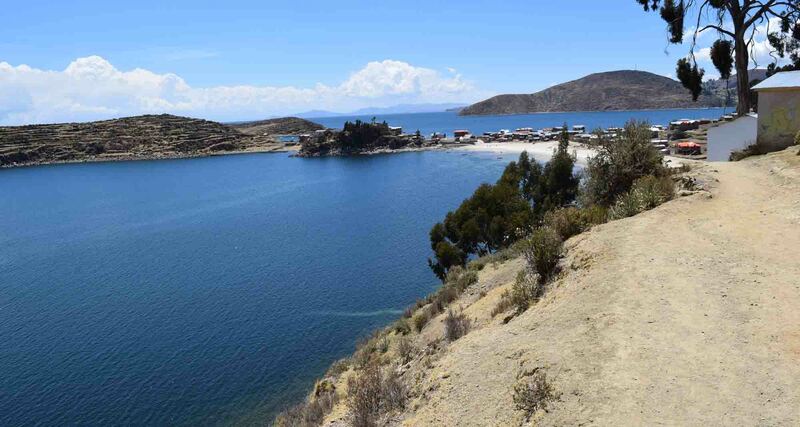 This amazing island can be found in the middle of Lake Titicaca in Bolivia. I had a good hike there in the blazing sun back on the very first day of November last year. 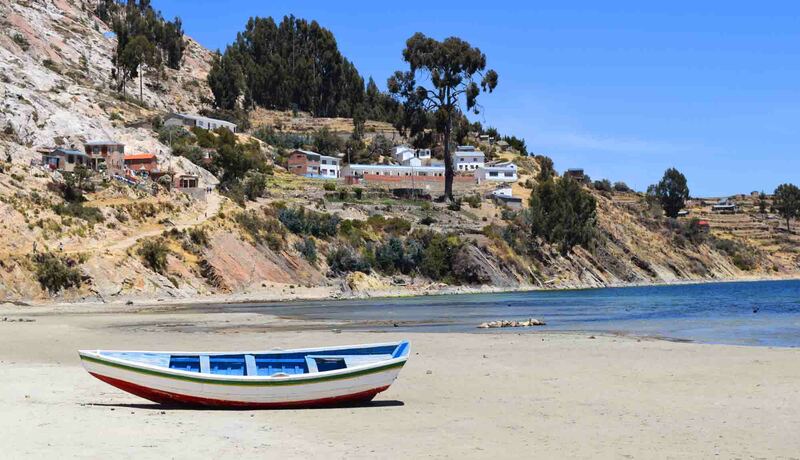 The boats leave from the small town on the shore of the lake, not too far from the Peruvian border, Copacabana. 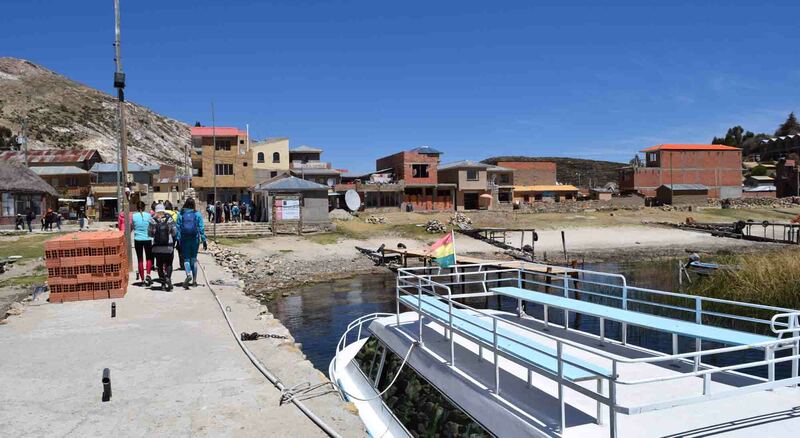 It’s a sleepy town with plenty of tourist agencies and the like who will sell you tours to various places, bus tickets and boat tickets to Isla Del Sol. You’re best to leave as early as possible if you do what I did and go there, hike and return in a single day. Boat prices ARE open to negotiation. I can’t remember if I paid $25 (I think that was it) or a bit less, but I heard people got tickets much cheaper (return). So bargain down as best you can. The ride takes a think three hours to get to the north of the island, and is quite scenic but after a while it gets a little boring too. 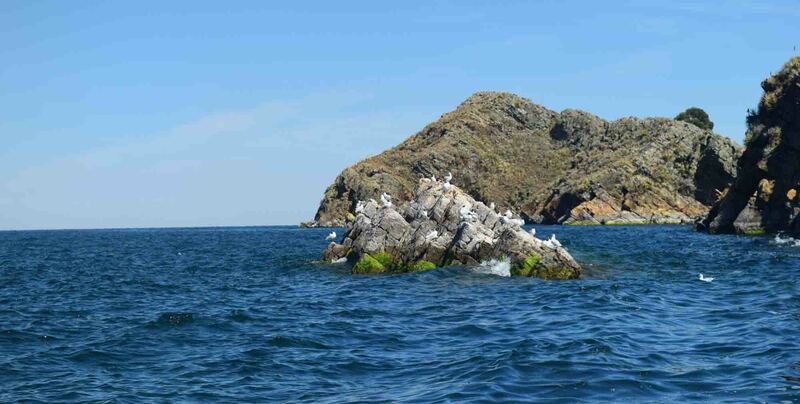 They make a couple of stops to the north of the island. The best way it seemed to work it was to go all the way north, hike south and get the boat again in the southern port. 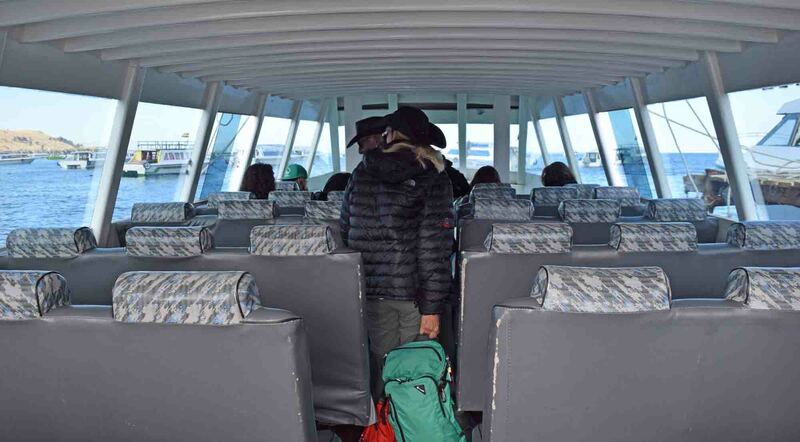 Inside the cabin of the boat. Which is what I did along with a nice couple I met on the boat. I’d had it all explained to me by the manager at Hotel La Cupula (he was very helpful) and he gave me a map and explained that you needed to keep moving on the trail or you wouldn’t make your boat back to Copacabana which left at around 330pm in the afternoon. Miss it and you’d be there overnight or have to buy another more expensive ticket on a different boat, if there was one. Some people do stay overnight there are plenty of houses and people and restaurants on the island, in the little port in the south, Yumani. The weather was mid to high twenties, the sun beat down as it does at altitude. 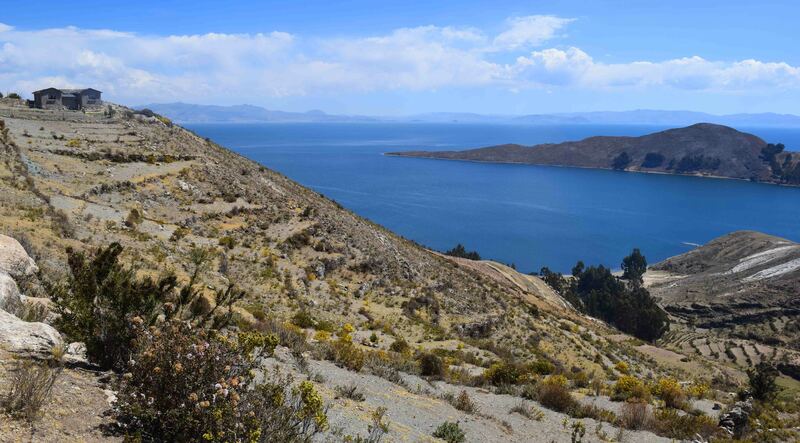 The coast of the island is around 3700-3800 metres and you climb to around just over 4000 metres. There are different check points at stages around the island and you have to pay a small fee. They employ people to stand out there all day, I spent a total of around $10US I think on these fees at three separate points. 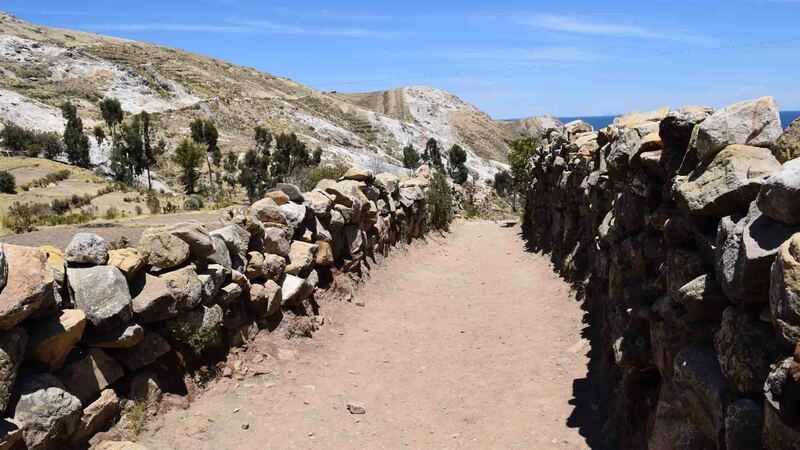 The first part of the hike took us from the boat to the Chinkana Ruins. 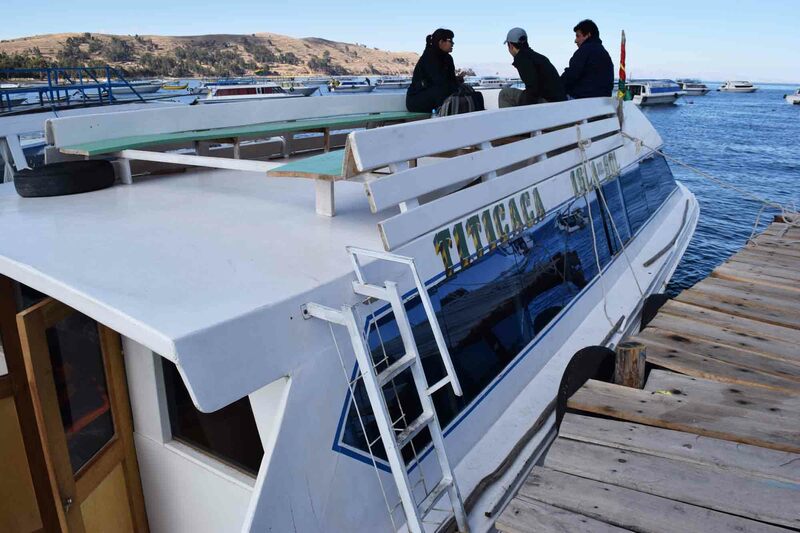 At the northern port we got a ticket which was 15 Bolivianos and included entrance to a museum but we had been advised it wasn’t worth visiting and with the time schedule best to skip it. I had to work my way around this fella. We walked over to another bay which was pretty and then began climbing. We went past a few houses and possibly a village. A place offered camping space and another rooms I think. 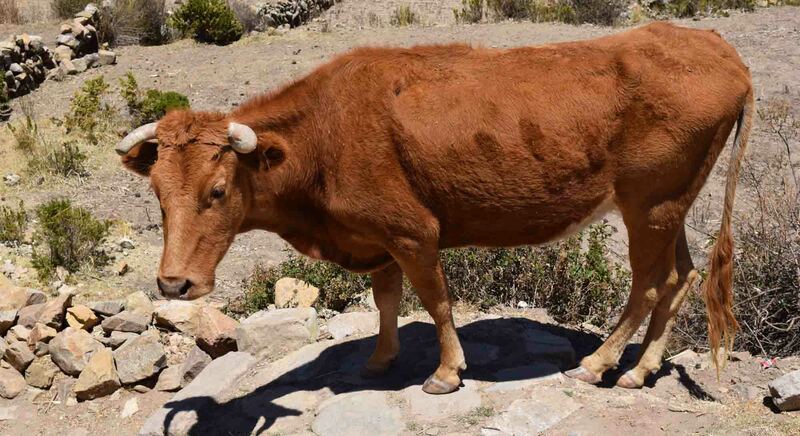 There was a bull that I had to negotiate my way around which was a little hairy, and some great stone walls. We crossed from the east to the west side and saw the ruins. They were interesting, almost cute. The area was pretty, but there weren’t a lot of trees. 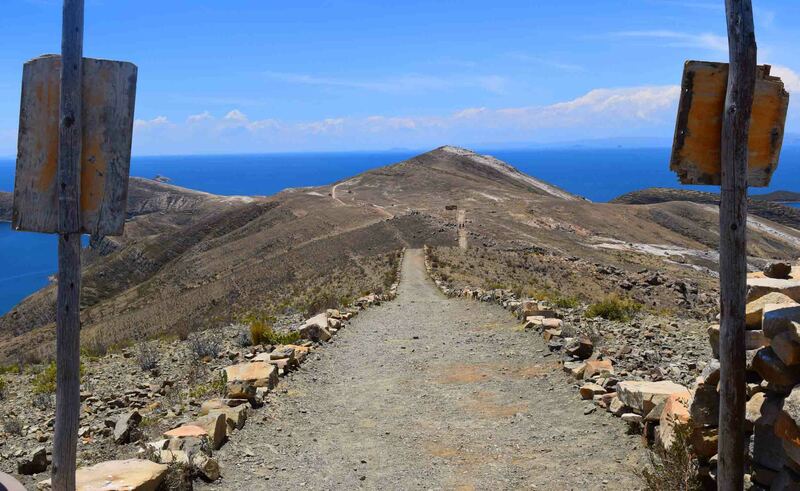 That was forty-five minutes of hiking, then onwards down the centre of the island, starting with some uphill fun. Which at 4000 metres ish is really no fun at all. Water was needed. There weren’t a lot of opportunities to buy drinks so I carried a couple of litres with me. I had my jacket over my head and kept applying sunscreen. 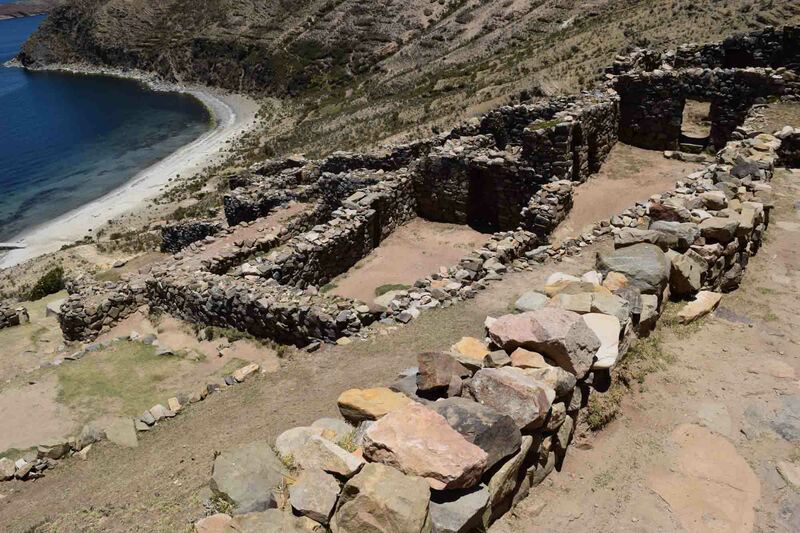 The Chinkana Ruins are the main ruins/site on the island. It really is just a few stone houses but it’s interesting enough and worth a few photos for sure. There’s a ‘sacred rock’ as well that somewhat looks like a stone picnic table. From there, it was uphill for a couple of kilometres. And before I knew it, what had started as a pretty pleasant walk turned challenging. The sun combined with the altitude and the rate of ascent left me pretty sweaty and struggling for breath. When you started and finish at the same elevation it means one thing on a hilly island – you go up as much as you go down. And this was the toughest stretch. The path over the hills was quite picturesque though and to the right we could, most of the time, see the coast and it was a very pretty coastline. At the top of the first (or was it second?) big hill were two men checking tickets. And we stopped for lunch. After that it wasn’t as steep and there were more downhill stretches. There was one hill I remember was very rocky and not so easy to scramble up. After 5 – 6km there was a little more vegetation, in fact there were a number of gum trees which gave some much appreciated shade. We were mostly on the descent too. 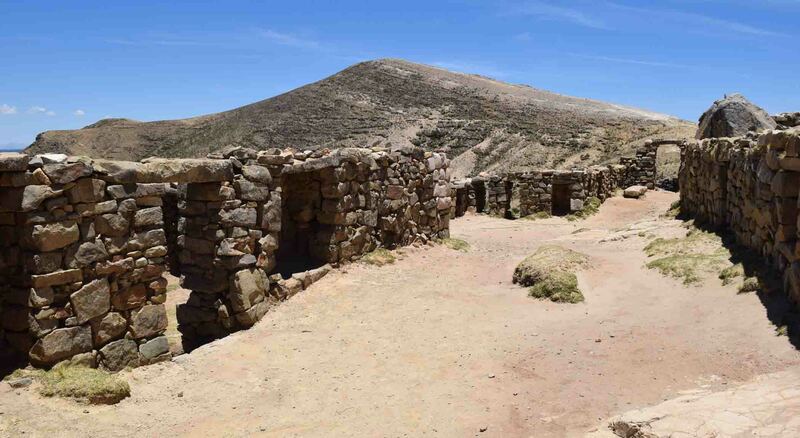 Houses reappeared as we entered the town of Yumani, seemingly from the back entrance. Then it was a sudden descent, much steeper than before. In fact it was good to know we didn’t go this steep upwards earlier. Although after walking 9 kilometres it’s not so easy to walk down a steep hill. And then, well, we were greeted by mules coming the in the opposite direction. 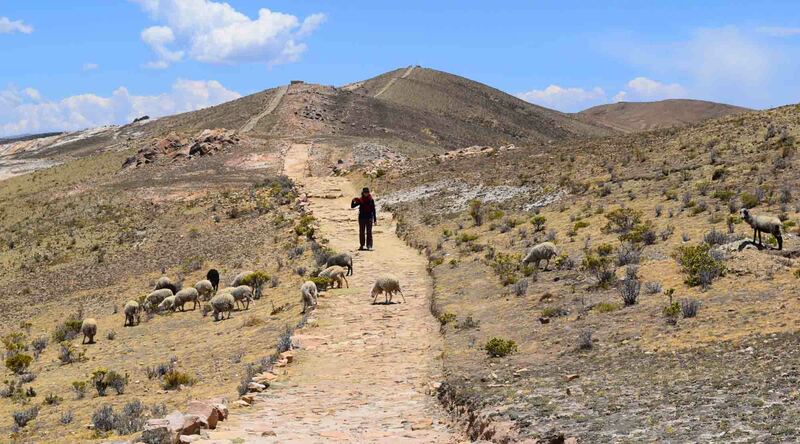 It was just a small stone path, but there were a number of mules and we had to get to the side quick-smart to let them by as they weren’t stopping for anybody. The people on the island survive without any land vehicles. And by three o’clock we’d made it to the port, 30 minutes early for the boat back to Copacabana. Bought some water, drank it fast. We’d stopped 20 minutes for lunch and maybe 10 minutes at the ruins, and as we came to the pier I was worried if we were in time. We made good time compared to others on the boat who arrived later, we were overtaken by just one group I think. So that’s a summary of what the walk was like for me. I recommend it as the number one thing to do if you’re in Copacabana. A night or two on the island would have been nice if I’d had the time. It was really good to walk with others and not by myself as I had originally planned. Bring water, and protect yourself from the sun any way that you can! This is an interesting journey. I think if you stay overnight on the island, you can see a beautiful dawn. yes i think that would be a wonderful option. thanks for reading! 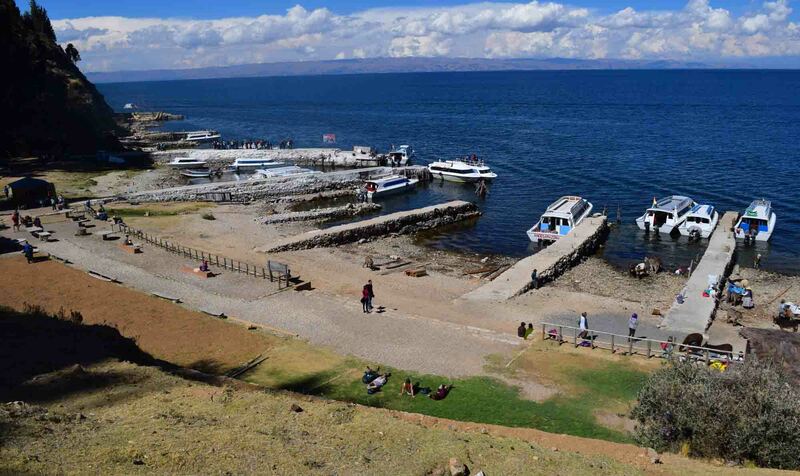 Interesting – an island in a huge lake in a landlocked country! 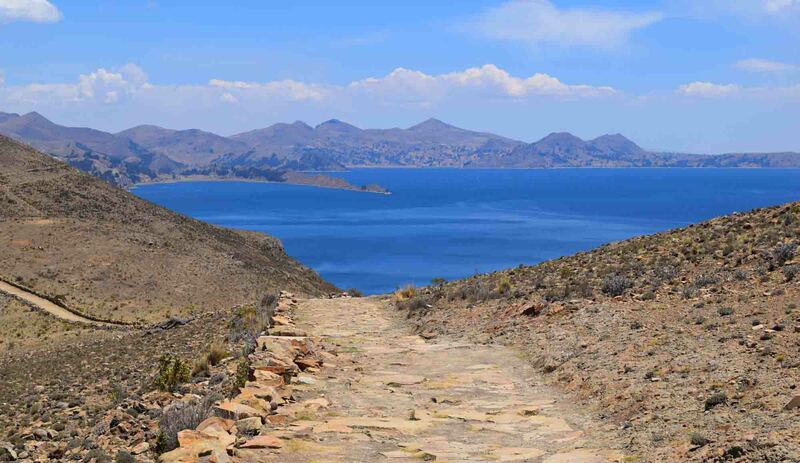 I’ve heard that Bolivia is the only landlocked nation to have a navy, and it’s because of this lake! now, that I didnt know!